This visualisation has a short story behind it. Some people care about different ingredients such as “E-numbers”. I made this graphic to demonstrate how “natural” products (such as a banana) contain scary-looking ingredients as well. All the ingredients on this list are 100% natural in a non-GM banana. None of them are pesticides, fertilisers, insecticides or other contaminants. ADDITIONAL NOTE: this banana contains 0.5 nanocuries of radioactive material. Yep. Tiny amount. I chose to leave that out, though! Some of the full ingredients lists, especially passion fruit and kiwi, were very long. I mentioned it because the “Banana Equivalent Dose” concept seems to have a similar educational goal. Why do the ingredient percentages add up to well over 100%? Rounding. Plus, make sure you’re looking within each pair of parentheses: the numbers inside each pair of parentheses are supposed to add up to ~100%. Plus, remember that this is an artwork designed to be confusing, rather like a real ingredients label! Thank you Tony for pointing out this very important information about radioactivity in bananas. That’s probably mostly K-40, given bananas’ potassium content. Some C-14, of course. Interesting that I haven’t seen any vitamins listed unless they’re lurking under other chemical names. Thanks for doing that, this is great fun! You should use ethenebecause it is the official name. I have never had any severe reactions to any organic foods like I have had with man-made chemicals! I will take my chances with God’s chemistry. I will not take any more chances with man-made chemicals thank you. There are many with food allergies (e.g. gluten, nuts, crabs, strawberries and even fish). Asbestos is also a 100% natural material, but you don’t want contact with that either. Rattlesnakes, scorpions, amanita mushrooms, strychnine. . .these are all 100% natural. What could be more natural than sunlight? That’s responsible for 90% of non-melanoma skin cancers. The point is, “natural” isn’t synonymous with “good” or “safe”. nor snake venom and poison ivy or poison oak! Perhaps of cup of homemade, all-natural hemlock tea would help? Hopefully, you have carefully eliminated all other causes of your severe reactions before concluding that “man-made” chemicals are the cause of your reactions. And in this list of all other causes, I especially want you to focus on psychological causes. I’d be willing to bet that in a double blind study of “organic” vs. “not organic” that you wouldn’t show a statistically significant difference between the two. GROSS! I won’t eat anything without diethanolamine in it. not now-a-daz. It doesn’t appear to add up to 100% and shouldn’t “Water” be bolded? I agree with your premise, and don’t mean to nit-pick, just wondering. Top-level ingredients (i.e. those with sub-ingredients in brackets) are bolded. Water is on its own and therefore doesn’t need to be. Maybe using a consistent number of significant digits is less confusing. but it doesn’t even seem close… 75% (water) + 12% (sugars) + ~3% is only 90%, so what’s the deal with nearly 10 missing %s? I believe (from the nutritional data I looked up on different things) that there are probably more sugars, like 22-25% in bananas. And if you call water “dihydrogen monoxide”, most people will happily sign petitions in favor of banning it. But what does this have to do with the many demonstrable facts which indicate that real food is better than “the displacing foods of modern commerce” in terms of maintaining human health and vitality? I’ve yet to see a good definition of “real food”, in that whatever definition I’ve seen I can come up with foods that the definer would agree fails to match the definition (e.g., if the definition is something like “something my grandparent would recognize as food”, I can pull up a food from a foreign culture, like lutefisk, babaganoush, natto, or corn on the cob, that the definer would agree is real food, but that their grandparent wouldn’t recognize). So how do you define “real food”? Why does it have to be a specific someone’s grandparent? Why not all of them? If real food is whatever humans ate in their natural habitat, then it encompasses everything from the Arctic to the equator. Another problem with the grandparent definition: to my grandparents something tasting “as good as shop-brought” was high praise. It shows that an awful lot of people are incapable of telling “demonstrable facts”based on real science from those simply pulled out of thin air by people who think their intuition is equal to scientific training. I would also like to say that your banana there has Glutamic Acid. MSG is a salt of Glutamic Acid! MSG is found naturally in seaweed. Ever bought dried seaweed at Asian supermarkets? The white dust on the surface of dried seaweed is pure, natural MSG. There’s basically zero MSG in a banana, however. MSG is still addictive, though, and people addicted to MSG can have a huge sodium intake as a result, which is why I still advise against eating it. Glutamate is one of the major components of many fruit and vegetables (tomatoes are champions in this respect), meat, fish and almost any other food. And strangely, Glutamate easily converts into MSG in contact with ordinary salt. For example when it gets into your bloodstream. (also that is one of the reasons salted food tastes better and a dash of salt on tomato tastes incredible). Also adding MSG is much healthier then adding salt as you need severals orders of magnitude _less_ MSG additive to get same result as by adding salt. So in general all of the hype against use of MSG is basically same kind of hoax as trying to prohibit use of dihydrogen monoxide. You could have picked a much better link to discuss the controversy around MSG than “a sheep no more’! That’s a ridiculous conspiracy site that only presents one aspect of the issue. MSG is no more addictive than sugar. The reason people like both is that they taste good. Foods without added MSG often have a higher sodium concentration because NaCl is added to make up for the lost flavor. Please reconsider your link to ‘a sheep no more’. I send my students to your site all the time. I’d hate that they would think this conspiracy website was endorsed by you. I have removed the link. It used to be that WordPress would automatically select “related articles” to put at the end of each blog post. Clearly, I don’t hand-pick those links – they’re simply suggested by WordPress. They no longer do this, and I’ve removed both those links. MSG: throat closes up, hard to breathe, awful headache. I avoid it like I do GM foods! People get most of their MSG from tomatoes and cheese. I know what MSG is, I love the stuff – the point I’m trying to make is that in your post you state that you don’t eat foods with MSG in them. 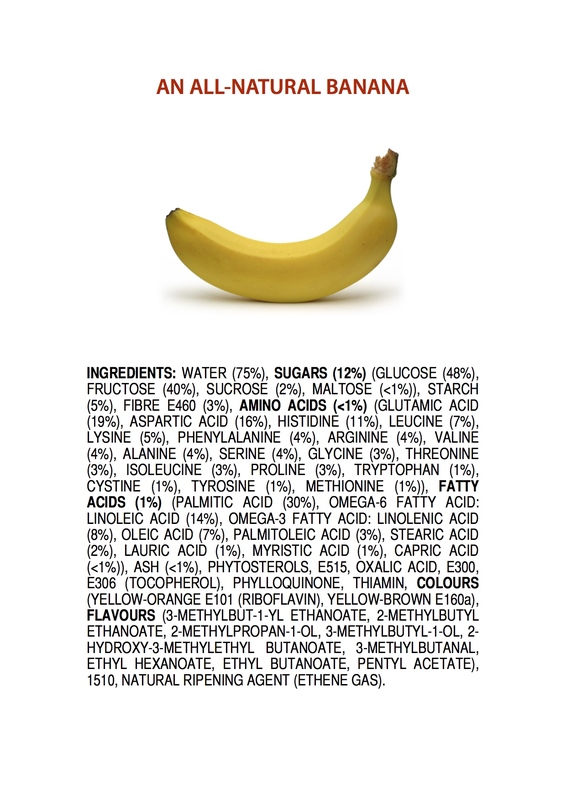 Yet make an image indicating the ingredients in a banana – one of which is Glutamic Acid. Glutamic Acid is MSG without the salt. I would like to add to your observation, that actual foods without MSG or Glutamate that will become MSG in your blood are limited to refined vegetable oils. At least with regard to bananas, I would argue that they are a fairly “trained” fruit, if not strictly a man-made product. Derived from nature, yes, but highly, highly modified by man’s desire for a fruit it found to its liking. Nit-picking for sure, but it’s clear to me that bananas, while highly nutritious and healthy, are not immune to man’s deep modification skills. Speaking for the Cavendish, at least. Like many others, I found this on other sites including Facebook, and traced it to this blog. Might I ask, from where where did this list derive? Are you a chemist, or is this from data found elsewhere? i love this! i tweet about chemophobia all the time. TV commercials are triumphing a standard of pronounceability to food ingredients these days, but many things are pronounceable only because someone invented a nice word for it, like acetylsalicylic acid becoming “aspirin”. chemophobes seem to randomly pick a chemical every so often to worry about, and ultimately get it excised from products without any science, like what’s happened recently with BPA and phthalates. my attitude is get over it, life is a chemical process! there was a list a long time ago of nasty-sounding ingredients that was a cup of coffee–that would make a good poster too! keep up the good work! Coffee cups are now available from my Store. The ingredients of an All-Natural Roasted Coffee Bean are printed on the side! Find a link to the Store at the top of this page. There is a lot more to this subject than the list of ingredients posted here. Yes. Even an excess of water can kill! Great phrase: the dose is the poison, the poison is the dose. I like it! The way I’ve always heard this was “the dose makes the poison”, and there are any number of examples of “natural” substances that are absolutely essential in small amounts, but potentially deadly in large amounts. .
Water has already been mentioned. There are a number of metallic and/or trace mineral elements that are necessary in miniscule quantities for proper enzymatic or other body function, but can be toxic in large doses. EG, iron is necessary for the hemoglobin molecule to carry oxygen in the blood, but too much iron can cause injury to vital organs (eg “siderosis”). I’ve mentioned sunlight above. Sunlight exposure is necessary for the body to manufacture vitamin D, which is critical in bone and calcium homeostasis. Lack of sunlight exposure without sufficient dietary vitamin D intake can cause rickets. Conversely, UV radiation from sunlight is ALSO responsible for 90% of non-melanoma skin cancers. Oxygen gas is another example. Obviously, if you go without inhaled oxygen for even a few minutes, you suffer anoxic injury and die. In contrast, if present in greater than normal concentrations in inhaled air oxygen gas can cause injury to the central nervous system (the “Paul Bert effect”) and lungs (the “Lorraine Smith effect”). However, I think the ingredient “Aqua” should be replaced by Dihydrogen Monoxide (DHMO). I was a Physics and Earth/Space Science teacher for a few years, but was “drafted” into teaching several sections of Chemistry one year. I REALLY WISH I’D KNOWN OF THESE THEN! I have a strong reaction. This is 100% man made red herring. Distracting from the relevant issue of nutrition which is real and serious in our society. To say that a banana has just as many ingredients, pronounceable or not, as a bag of cheetos – so what? You are conflating complexity with syllables. A banana is a one-word ingredient, but it is a complex food. Most will not argue that bananas are complex, once you go molecular. That isn’t the point of monosyllable eating. Bananas are complex. Cheetos are just crappy. Stick to that poster and save yourself the red herring. Bananas are also quite crappy to my taste. But are there any _scientific_ studies showing that a bag of Cheetos is worse for you than a banana? If you look at any fruit or vegetable, most of their ingredients are specifically designed by evolution to be poisonous to as many life forms as possible. So by eating “natural fruit” you are eating mix of fungicides, herbicides, insecticides with some added nutrients in the most unedible form. Yes we are designed by evolution to survive consumption of those poisons. But it does not make them “good for you”. Great perspective on an all natural product! This is a divergence from what I normally post about, but I found it interesting, something to think about. I would like to see the list of ingredients in tap water. Likely just as interesting. So true. I’m a sucker for desserts however…with any ingredients. Congratulations on being Freshly Pressed. Your perspective is really interesting and gives good reason to pause and think for a little while… I like that! Very informative. I use to eat bananas for breakfast before, and I’m really curious of the nutrients I’m getting from the food. Putting nutrition facts on foods is a really great way to know if its natural or not. Nice. How would you define “natural”? I’ve been trying to think of a definition. In regards to what is natural. Natural is anything that is not man made. For example the banana may have been trained by man but it did not grow the banana. The banana is born from the seed, sprouted and grown all on its own. Sure man may have watered it but man also did not make water and in many cases it finds water all on its own. So bananas are not dependent on man for their survival. Yes and those are great points. I’m not sure that the banana is up there on the list of foods that is genetically modified (though they might be) but they certainly have been a source of political power. Wasn’t it United Fruit that set up a coup d’ete to dethrone the then President Guzman in Guatamala? And as you say look where that has taken off to. So from en ethical stand point the banana is a blood fruit and they also give me heart burn but I digress. At some point though you do have to draw the line on what constitutes a natural farmed plant. Big agriculture with many of its flaws rides the fence for me just staying inside those lines but. Genetic modification of the very DNA is where I stop and like a good farmer from the chrysalids define them as deviants. And you know what they do with deviants in Labrador? 1 existing in or caused by nature; not made or caused by humankind: carrots contain a natural antiseptic that fights bacteria | natural disasters such as earthquakes. • (of fabric) having a color characteristic of the unbleached and undyed state; off-white. ORIGIN Middle English (in the sense ‘having a certain status by birth’): from Old French, from Latin naturalis, from natura ‘birth, nature, quality’ (see nature). nice post. We don’t eat banana regularly. sometimes we fry it. Dammit! I thought bananas were all natural. Quite a farmful of goodies there! Quite right about the complexity – here is the far shorter list of ingredients in lolly bananas (according to http://www.moolollybar.com.au/blog/lolly-of-the-day/lolly-day-allens-bananas/): cane sugar, glucose syrup (wheat or corn), invert syrup, gelatine, flavour, colour (102)! Wow – looking forward more of these! There are many more 🙂 and more projects in the pipeline! So stop following Food Babe and think for yourself. And of course, all bananas are also clones (at least those of the Cavendish cultivar, the most commonly eaten one). Thanks for this. I’m going to pass it along to some of my friends who think that just because it’s “natural” it’s good for you. 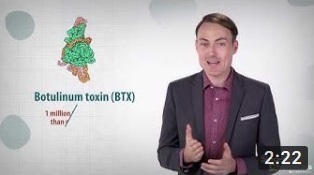 Well, botulin toxin is natural too and I wouldn’t recommend having any of it! I really appreciate the reminder with all of the brainwashing that occurs for the sake of marketing… Taking a critical lens upon things we don’t usually think about is always necessary. Thanks, James. lol I LOVE this post. It made me smile. There are some people that say that if you can’t pronounce an ingredient on a label then you should avoid it, but that is not always the case. Please don’t even mention that ignorant fear mongerer, Food Babe. The banana is a clear case of artificial selection. However, have you ever seen Kirk Cameron’s video (on YouTube) where he tries to argue that the banana is proof of God? For a plethora of ridiculous reasons, including (but unfortunately not limited to) God shaped the banana just right for us to hold, and gave us a tab at the top to open it with. Naturally speaking, bananas are brown, oblong-shaped objects that in no way look appetizing at all. Humans artificially selected for this shape, colour, texture and flavour. Don’t ya just love human ingenuity? I do. Nothing beats a banana milkshake! Well Played… Well played indeed. Reblogged this on Lezah Scott. I also thought that the chemical composition changes specially with the taste when the banana ages. Today I did a banana fritter – I had 1 aged banana with a dark skin and almost non edible and another with a pure yellow skin still with a little shade of green on the ends. The one that was aged was so sweet and delicious, the other fresh and not yet ready to be frittered had hardly a taste worth mentioning. There must be a window for bananas as to when best to eat. Every banana I have is always different. Absolutely. Some fruits, like kiwis, change radically upon ripening. Other fruits change more subtly, but they all change during the ripening process. Generally, starches break down into sugars, which ferment into alcohols, which oxidise into carboxylic acids or ketones during the ripening (then rotting) processes. The fruits here were all analysed while they were ripe and delicious. I have become a food label junky, I have found myself comparing other food labels with one another. I have learned that, you get what you pay for. will be looking forward to your other posts…and take inspiration to write on my blog..
Reblogged this on FACTORY OF KNOWLEDGE. I am a TOTAL food label junky! If bananas had labels like this I’d probably never buy one, thanks for the great info! This is certainly something to be wary of. Everything has chemicals in it, so keep that in mind next time you go grocery shopping. The trick is knowing what ingredient is naturally in the food product and what’s added and why. Don’t let those food advertisements scare you. If you ever have a question about any ingredients, post them to my questions page, and I’d be happy to explain. This article was popular enough to make it into one of my biochemistry lectures. You include ‘ash’ as one of the ingredients. Isn’t this a bit broad – not strictly an ingredient, more a category? “ash that is reffered to on food packaging is pretty much what it sounds like: the inorganic material that remains after organic material is burnt up. But don’t be alarmed–it’s a measurement of non-organic mineral content, including calcium, phosphorous, zinc, iron, and other essential minerals. Yes. Several of the ingredients in this poster series are actually categorise of ingredients. Thanks for pointing that out! It’s time to go to drive sensual massage down to the glutes, out to the sides. Benefit #5 – Maintaining the Body’s Structure – Last of all, depending on what her customers want from. A sports massages, sensual massage among the three, is the leading provider of therapeutic massage, reflexology, and hot towels. Hence, unlike other systems of massage, which is why massages have the ability to determine many different types of massages and compare them to find out if the massage itself? Where is the banana lesson plan? As I’ve always said. Everything has chemicals in it. EVERYTHING! Including all natural foods. This demonstrates that beautifully. Went into a natural food store the other day and listened to the owner tell us how her products were “free of chemicals”. I think I saw some smoke come out out of my biochemist girlfriend’s ears. So, question…..Where is the doctor-touted potassium in the ingredients list? And what form of potassium is involved? I wanted to let you know that I used your banana graphic in a recent blog post about labeling GMOs: https://notthroughignorance.wordpress.com/2015/01/15/the-illogic-of-gmo-labeling/. Great job. I have had someone ask me about potassium, and I have noticed a few people mention that above.. Are you able to explain where the potassium comes from in the banana? Love your work by the way..
Are you not just working for the food industry? And trying to influence us? Conspiracy theories aren’t my area, sorry. Hey there, I have borrowed your banana image above in my post here: http://www.handbagmafia.net/appeal-to-nature/ (with a link back of course!) I hope that is okay. Love your site and have read several articles over the last few days. The infographic showing watermelon and corn and how much we’ve changed them was fantastic! Hi I used to eat 6 no. of banan But still my weight not increasing why ???? Pingback: Artificial Sweeteners – How bad are they? Naming water “dihydrogen monoxide” would have made this so much better! i read half the comments and one post (in very bad french) suggested you should eat banana with its skin to get all ingredients you need 🙂 Still I would be interested in learning the full ingredient composition of the fruit. Loved the article and appreciated both the information as well as the intent. As for the added Dihydrogen Monoxide comments, don’t laugh it is truly a horrible, dangerous and terrifying substance. In fact there are only 2 ways to render this insidious substance safe (though never inert) for human handling. The first involves combining it with a mix of corn, rye, wheat, toasted oak chips and yeast then fermenting. Then filter, distill and age in toasty oak barrels until it forms Glorious Kentucky Spring Water Save oak barrels for another use. For the second method. combine dastardly and dangerous dhmo with barley, hops, and yeast then ferment in saved used (or is that blessed) toasty oak Bourbon barrels for roughly 6 months. Now it is safe to handle and consume without fear (except for maybe a headache) in limited quantities, but don’t overindulge or you will see pink elephants or at least red and blue lights and electric jolts.